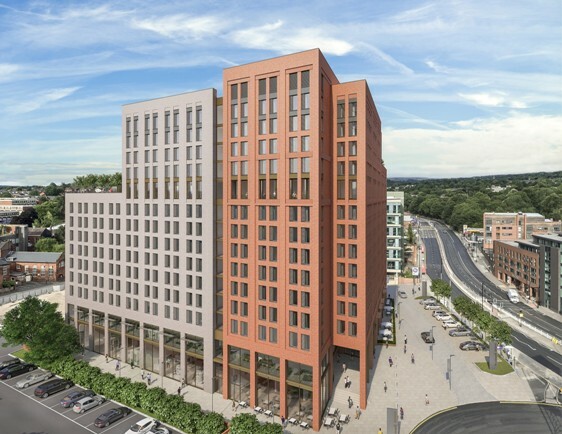 Valeo is working in partnership with ISG, to develop a 586-bed high-specification building located in a strategic location close to the two Sheffield universities. The tiered building was designed by Valeo to provide students with an outstanding residential experience. Residents will benefit from high-specification and spacious communal facilities, including a central club lounge with extensive balcony on the ninth floor overlooking the city, as well as lounge and study spaces, a café, private dining, cinema and gym. ISG has concluded the demolition of an existing garage structure on the site, and is set to commence the construction of the concrete frame building, reaching 14-storeys at its highest elevation, which fronts Ecclesall Road. The building will feature traditional masonry, with brick feature panels to its façade. Accommodation is configured around four, five and six bed clusters, as well as a number of studio apartments – all with en-suite facilities. Every bedroom will benefit from all the latest advanced technologies a student can expect, such as super fast WiFi available in all rooms. ISG will also form car parking spaces for seven retail units, which will occupy the ground floor of the new building – adding to the retail provision of this popular area of Sheffield, with the project scheduled for completion in summer 2019. ISG has a growing portfolio of keynote student accommodation schemes across the country and is additionally on site delivering a £40 million 675-bed scheme in central Cardiff, and a 412-bed £39 million mixed-use scheme in the heart of Liverpool.